They'll delight in driving their large authentic CASE IH tractor with its extra-large stake-side detachable trailer; 3 to 7 year olds will delight in loading up the trailer and delivering their treasures. The adjustable seat has flip-up armrests. 2-Speeds; 2¼ or 4½ mph, plus reverse, automatic brakes and 4WD farm tractor wheels makes driving easy, comfortable and safe. Parents control the speed with the 2nd gear lockout feature. 12-volt rechargeable battery and charger included. 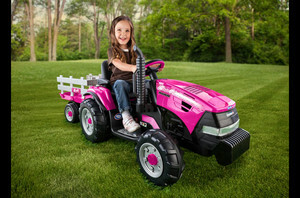 Ride-on vehicles are priced as assembled. Please call the store for more information on getting this item unassembled. We are unable to include free shipping on this item as it is too large for standard shipping. We would be happy to deliver it to you if you reside in the area or you can come to the store and pick it up. •2-Speeds 2 ½ or 4 ½ mph (4 ½ mph parental lockout for beginners). •Reverse Switches easily to reverse mode, just like the real deal. 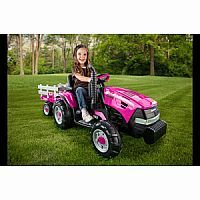 •Pink New pink décor allows girls to have their tractor on their terms. •Cargo Extra-large stake-side trailer (21.5" x 14.5" x 9.75"). •Wheels Farm tractor wheels provide traction on grass, dirt, gravel or pavement. •Room to Grow Adjustable seat with flip-up armrests. •Power Up 12-volt rechargeable battery and charger included. •Weight Capacity Can hold up to 85 lbs.